"Very easy to make and very tasty! I tried these at an Italian festival; they were very good, but they needed a little something more to them. So I added more ingredients, which makes them even better! You can substitute mozzarella or provolone cheese for the feta, or use a combination of the three." Heat a large skillet over medium-high heat, and add the Italian sausage, sliced pepperoni and crushed red pepper flakes. Cook and stir until the sausage is well browned and cooked through, about 8 minutes. Drain fat from skillet. Stir in the spaghetti sauce and salsa. Cook until meat and sauce are hot, about 5 minutes. Spread the tortilla chips on a very large platter. 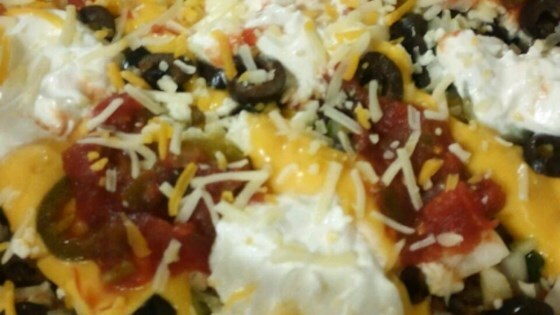 Spoon the hot meat sauce evenly over the chips and top with the feta cheese, chopped onions, jalapenos, black olives, and sour cream.